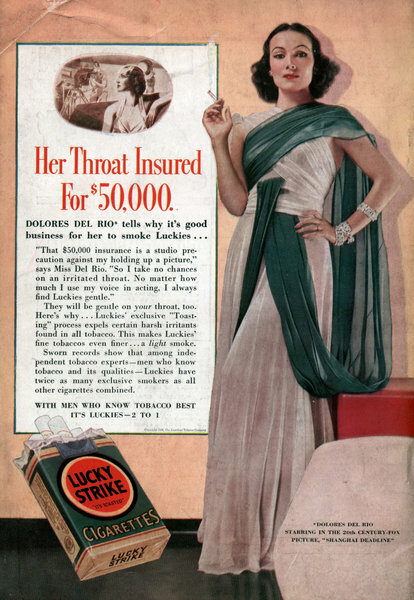 DOLORES DEL RIO* tells why it's good business for her to smoke Luckies... "That $50,000 insurance is a studio precaution against my holding up a picture," says Miss Del Rio. "So I take no chances on an irritated throat. No matter how much I use my voice in acting, I always find Luckies gentle." 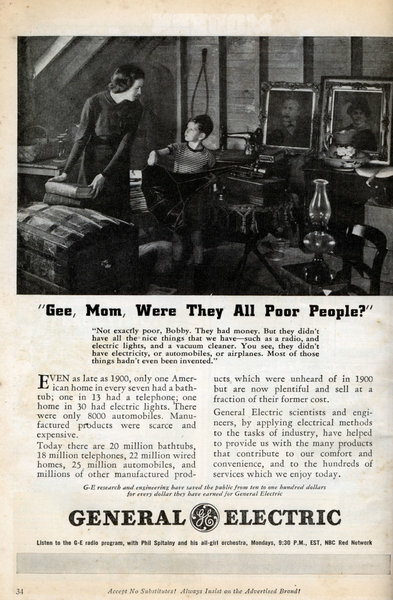 "Gee, Mom, Were They All Poor People?" "Not exactly poor, Bobby. They had money. 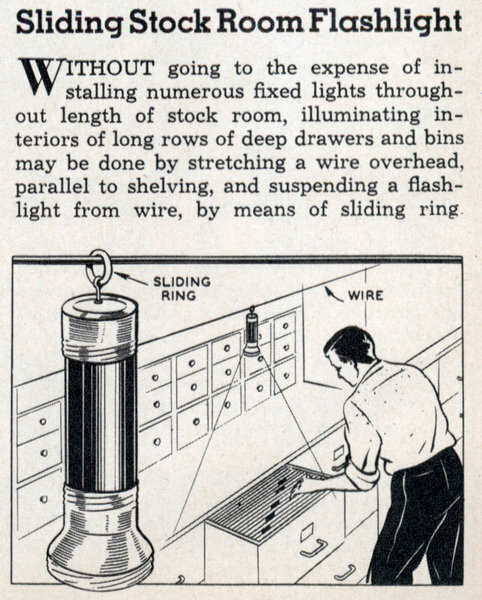 But they didn't have all the nice things that we have—such as a radio, and electric lights, and a vacuum cleaner. 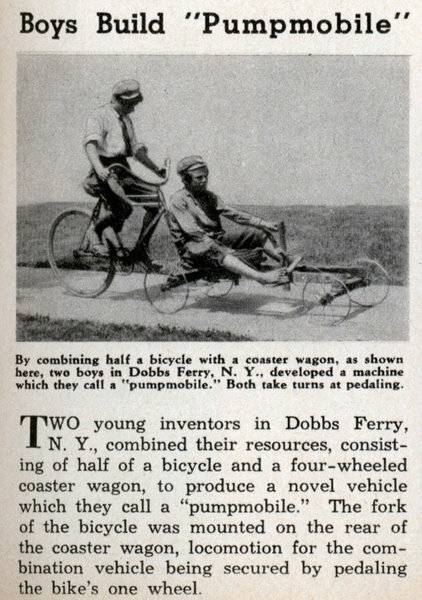 You see, they didn't have electricity, or automobiles, or airplanes. Most of those things hadn't even been invented." 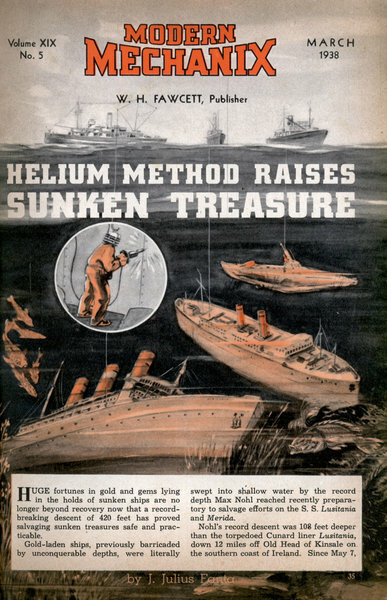 HUGE fortunes in gold and gems lying in the holds of sunken ships are no longer beyond recovery now that a record-breaking descent of 420 feet has proved salvaging sunken treasures safe and practicable. 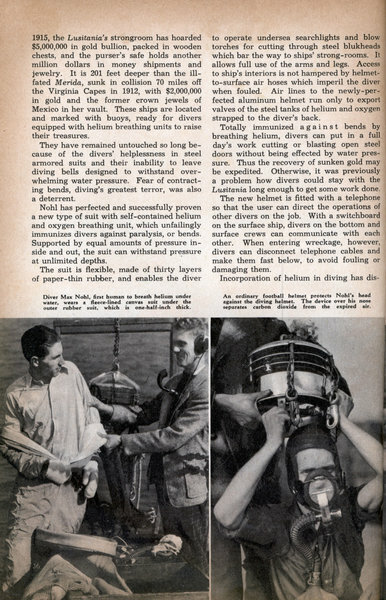 Gold-laden ships, previously barricaded by unconquerable depths, were literally swept into shallow water by the record depth Max Nohl reached recently preparatory to salvage efforts on the S. S. Lusitania and Merida. Waterproof Sand Exhibited W/ATERPROOF sand constituted one of the many marvels of modern chemistry exhibited at a Chemical Industries Exposition recently staged in New York, N. Y. 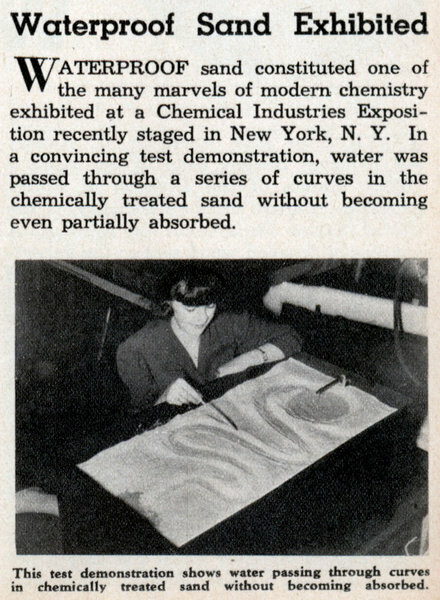 In a convincing test demonstration, water was passed through a series of curves in the chemically treated sand without becoming even partially absorbed. 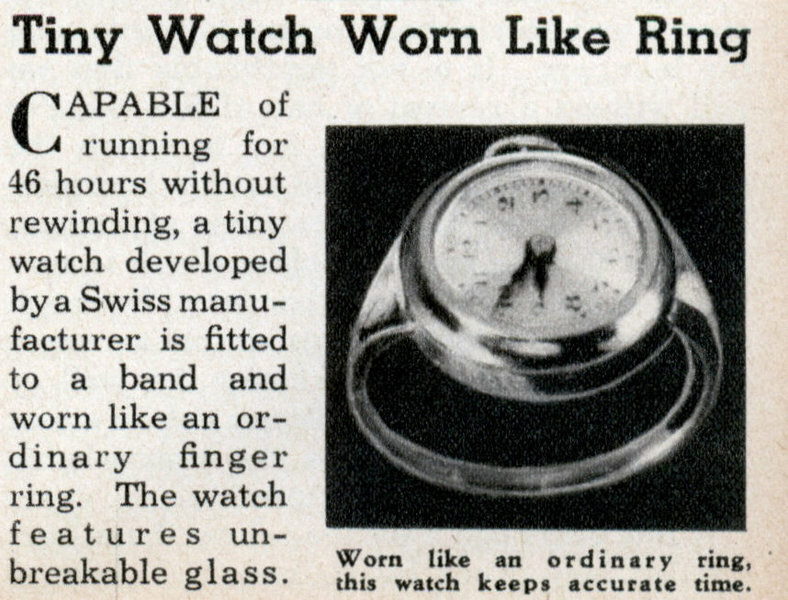 Tiny Watch Worn Like Ring CAPABLE of running for 46 hours without rewinding, a tiny watch developed by a Swiss manufacturer is fitted to a band and worn like an ordinary finger ring. The watch features unbreakable glass. 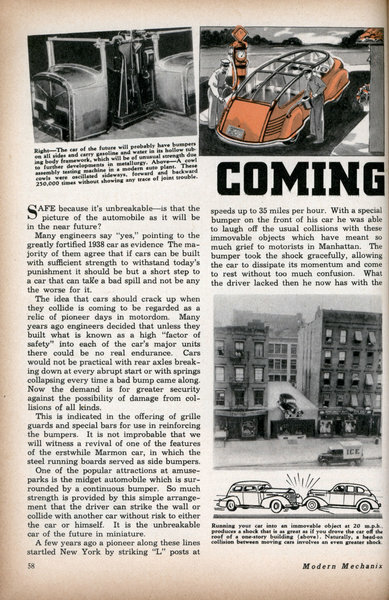 Coming Cars that Can "Take It"
Is the crashproof car a dream? 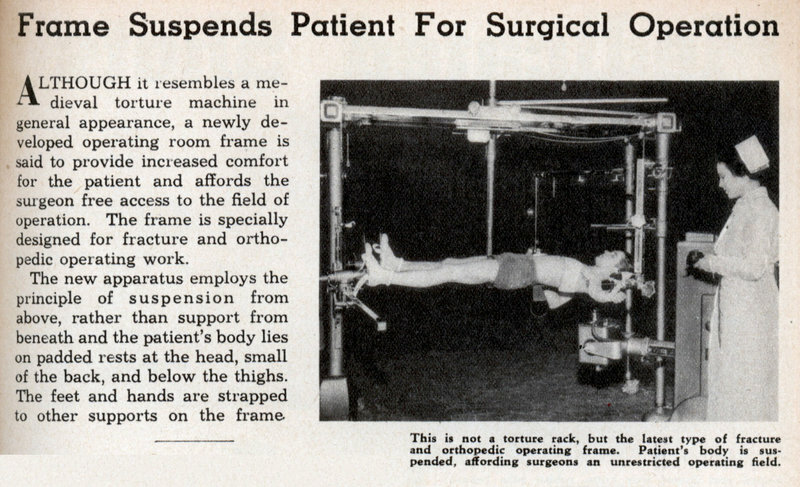 Read this prophetical article. 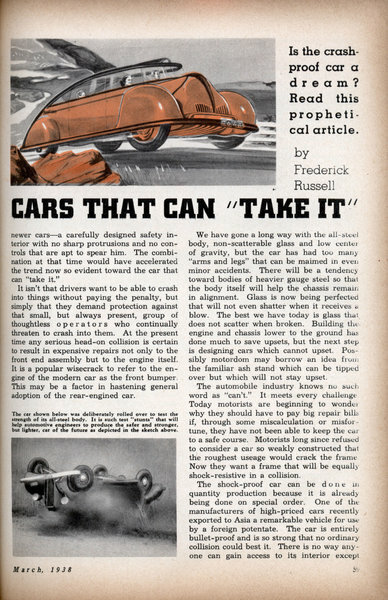 by Frederick Russell SAFE because it's unbreakableâ€”is that the picture of the automobile as it will be in the near future? 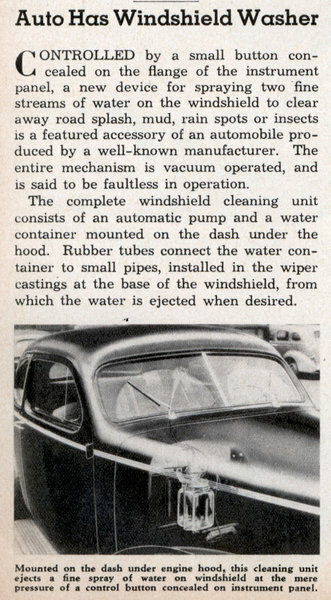 Many engineers say "yes," pointing to the greatly fortified 1938 car as evidence The majority of them agree that if cars can be built with sufficient strength to withstand today's punishment it should be but a short step to a car that can take a bad spill and not be any the worse for it. 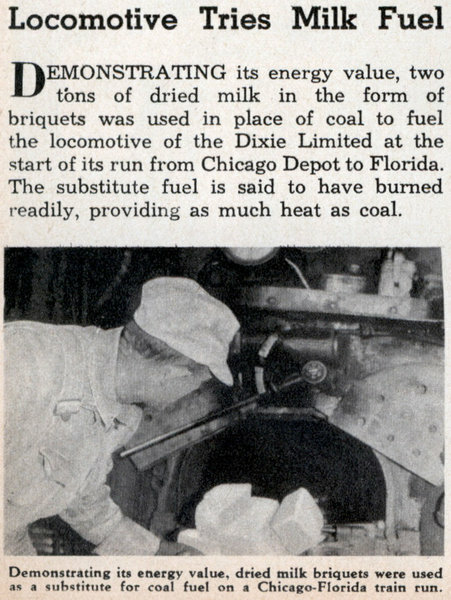 As destructive as a racketeer's bomb, combustible dust exacts its toll of business. 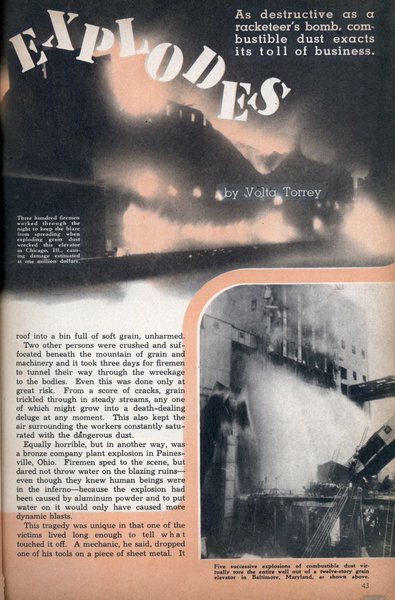 by Volta Torrey HAUNTING America's castlesâ€”those gigantic, concrete structures dotting the shipping terminalsâ€”is a public enemy more deadly than all the ghosts of all the medieval citadels known to man. "Combustible dust" is the name of this insidious foe. It lurks in 28,000 elevators, mills, factories and warehouses, a constant menace to the lives of 1,325,000 Americans and $10,000,000,000 worth of property. 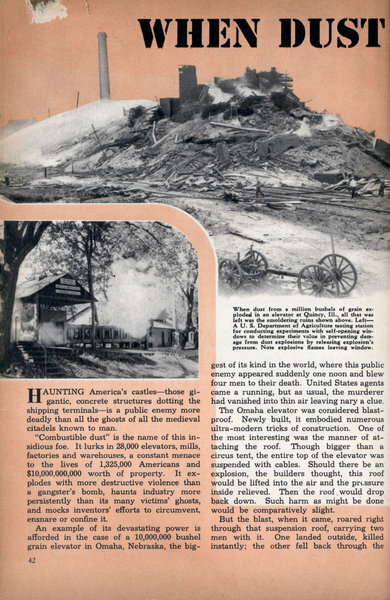 It explodes with more destructive violence than a gangster's bomb, haunts industry more persistently than its many victims' ghosts, and mocks inventors' efforts to circumvent, ensnare or confine it. 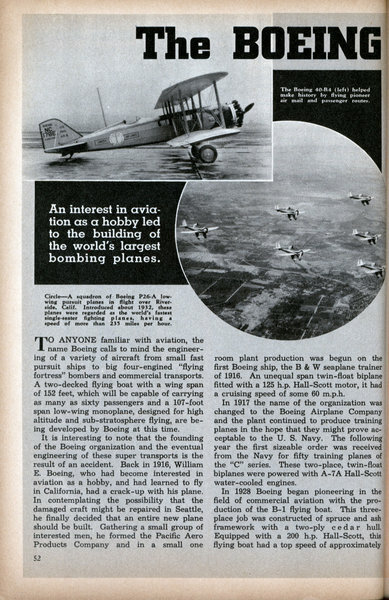 An interest in aviation as a hobby led to the building of the world's largest bombing planes. TO ANYONE familiar with aviation, the name Boeing calls to mind the engineering of a variety of aircraft from small fast pursuit ships to big four-engined "flying fortress" bombers and commercial transports. A two-decked flying boat with a wing span of 152 feet, which will be capable of carrying as many as sixty passengers and a 107-foot span low-wing monoplane, designed for high altitude and sub-stratosphere flying, are being developed by Boeing at this time. 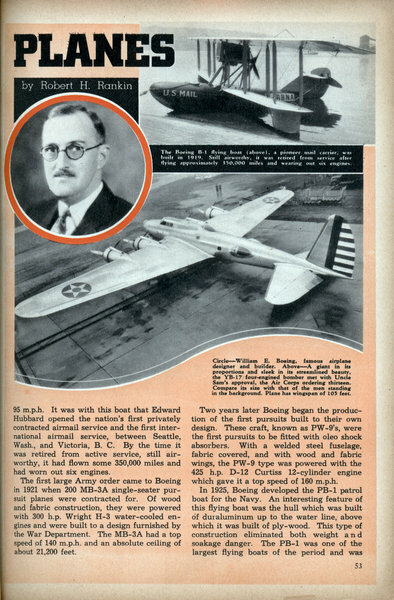 It is interesting to note that the founding of the Boeing organization and the eventual engineering of these super transports is the result of an accident. 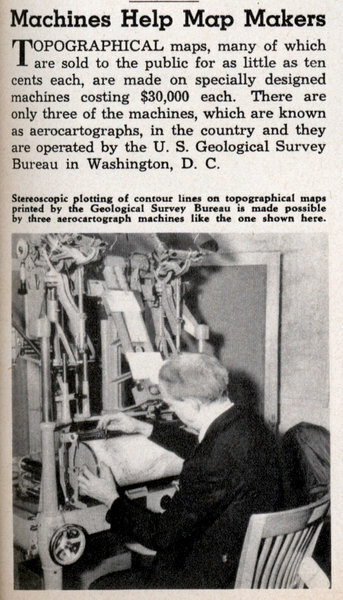 Back in 1916, William E. Boeing, who had become interested in aviation as a hobby, and had learned to fly in California, had a crack-up with his plane. 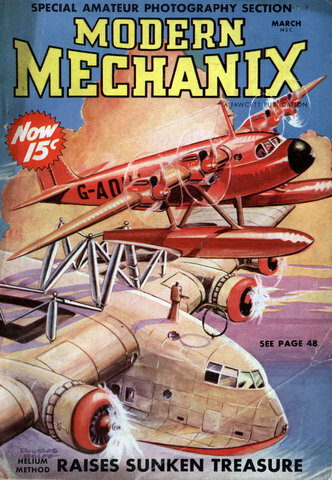 In contemplating the possibility that the damaged craft might be repaired in Seattle, he finally decided that an entire new plane should be built. Gathering a small group of interested men, he formed the Pacific Aero Products Company and in a small one room plant production was begun on the first Boeing ship, the B & W seaplane trainer of 1916. 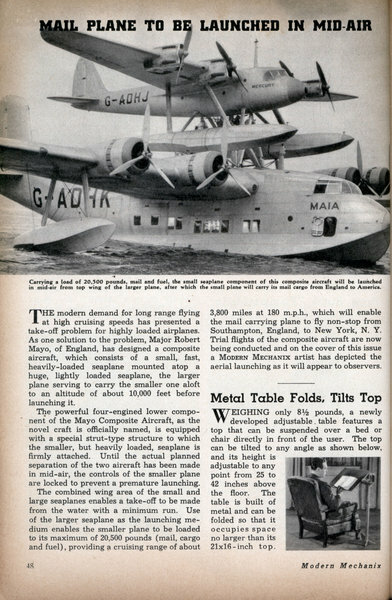 An unequal span twin-float biplane fitted with a 125 h.p. 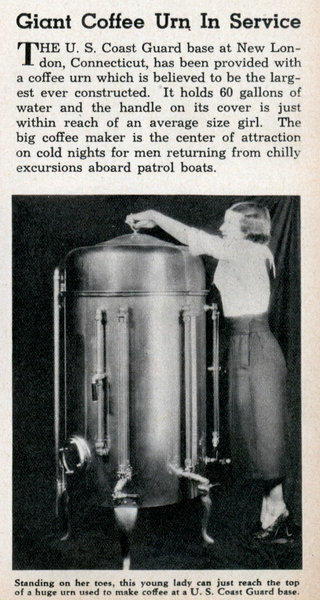 Hall-Scott motor, it had a cruising speed of some 60 m.p.h. 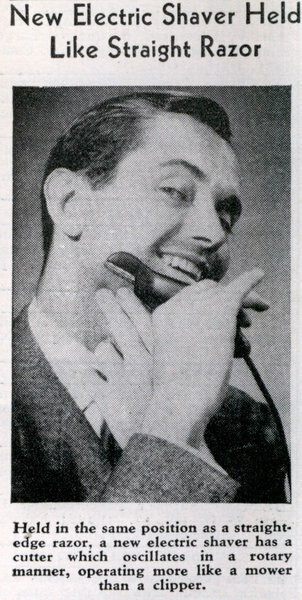 New Electric Shaver Held Like Straight Razor Held in the same position as a straightedge razor, a new electric shaver has a cutter which oscillates in a rotary manner, operating more like a mower than a clipper.